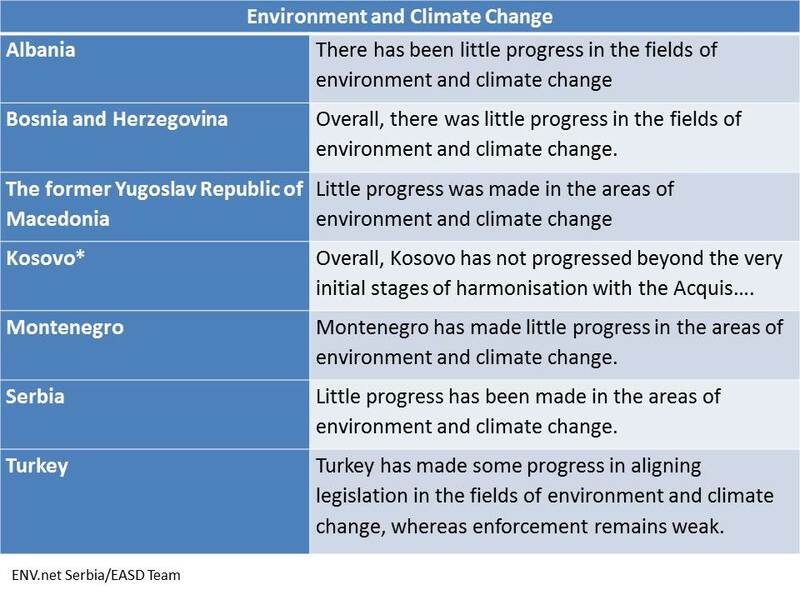 Little progress has been made in the areas of environment and climate change. 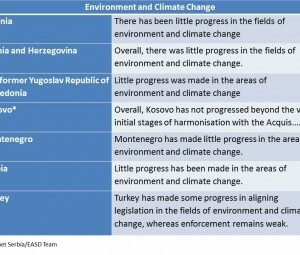 Strategic planning, greater administrative capacity and substantial investments linked to strategic priorities are needed to further align with EU policies in areas of environment, climate action and civil protection. A pipeline of investment priorities was developed in May 2014. Efforts under way to straighten inspection and enforcement need to be accompanied by the removal of the inconsistencies and gaps in legislation that prevent effective enforcement. An effective and permanent financing system for environment and climate change is needed. The country needs to put forward by the first quarter of 2015 its intended contribution to the 2015 Climate Agreement. Overall, priorities in the fields of environment and climate change have started to be addressed.